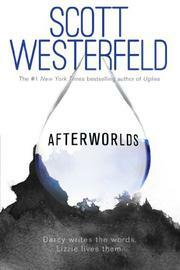 Westerfeld offers two novels in one: the story of Lizzie Scofield, a teenager who escapes a terrorist attack by somehow crossing into the afterlife and develops a relationship with a “smoldering Vedic psychopomp,” and the story of 18-year-old Darcy Patel, who has just signed a contract to publish the novel Lizzie anchors. In alternating chapters, the two books unfold. The still-living Lizzie pursues a relationship with Yamaraj, who protects newly crossed spirits from otherworldly predators, even as she negotiates her new powers to cross over and interact with ghosts, especially the little lost soul who haunts her closet. Meanwhile, Darcy decides to forgo college for the glamor of a writer’s life in New York City, struggling to revise Afterworlds and draft Untitled Patel as she watches her $300,000 advance vanish into agent commissions, rent, and fancy, foodie ramen. She also enters the tightknit, often bitchy world of YA writers, where she meets and falls for Imogen. Westerfeld clearly has a good time here, but he resists broad satire, focusing on Darcy’s coming-of-age as a writer who’s got the “juice.” Likewise, Darcy’s novel isn’t half bad, displaying a control that’s missing from far too many paranormal debuts. Readers who pay attention will see how Darcy’s learning curve plays out and how she incorporates and transmutes her real-world experiences into her novel.